If travel is a state of mind, Oregon sure makes you think, how can one state offer such varied scenery and recreation? Even for the seasoned traveler, there’s endless supply of secret places ripe for exploring. Which brings us to a unique section of the Oregon Coast — best known as Oregon’s Adventure Coast — where you’ll find three state parks that are distinct, easy to reach and offer unique perspectives. 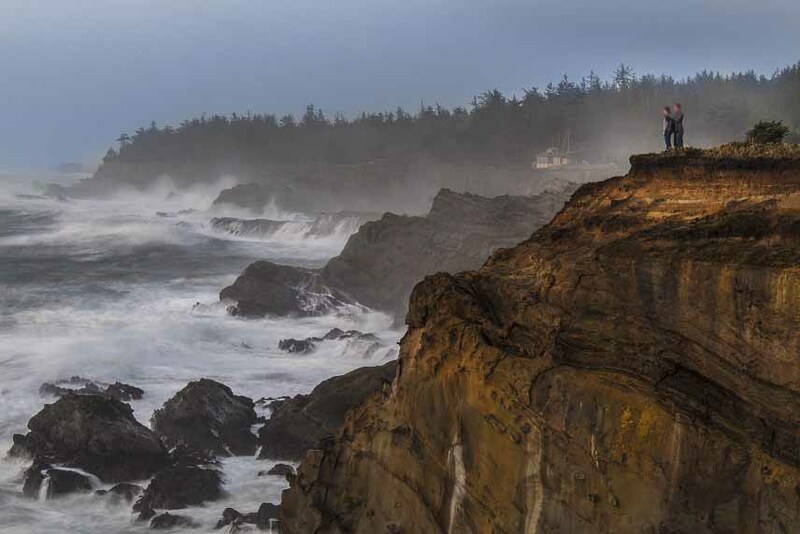 Along the Cape Arago Beach Loop, discover a collection of sights and sounds that will inspire, excite and motivate your travels along the South Coast near Charleston and Coos Bay. Our home on the road is a perfect fit at a campground that takes the breath away: Sunset Bay State Park. Just 2 miles to the south, Oregon’s only botanical state park, Shore Acres State Park, is gorgeous any time of year — but even more inviting during the fall season when something special gets underway. The annual Holiday Lights at Shore Acres offers the very best in community service and a wonderful holiday gift for you to enjoy. It’s safe to say that most holiday lights don’t hold a candle to the ones the Friends of Shore Acres State Park put up each year. The folks who show up each weekend beginning in late October go the extra mile to light Oregon’s only botanical garden state park. The Holiday Lights has been a community fixture for 30 years — and those 6,00 lights have grown to more than 300,000. Shirley boasts that one time she logged more than 8 miles of walking across Shore Acres sprawling 7-acre garden, directing, advising and motivating her volunteer troops. Like holiday elves, 1,500 volunteers now follow the Bridgham’s lead. A small, dedicated group of 25 or so who will spend their free time on weekends, putting up the park lights and displays in time for opening night on Thanksgiving Day. David Bridgham says that that by giving so much of their time and energy to make the Holiday Lights come to life each year, local folks get even more back in return. Twenty-four miles east of Coos Bay — where a part of the Glenn Creek watershed reveals a protected old growth myrtlewood forest towering overhead — it’s a state park property you may have missed: Golden and Silver Falls State Natural Area. At 254 feet, Golden Falls is among the tallest waterfalls west of the Willamette River. Its spray and sound leave you breathless, just like everything you’ll experience at this sanctuary near the sea.